Passengers aboard five select Holland America cruises are going to have a special - and tasty - culinary experience. Passengers aboard those five cruises will be introduced to the finest local cuisine and beverages and enjoy special culinary themed shore excursions. 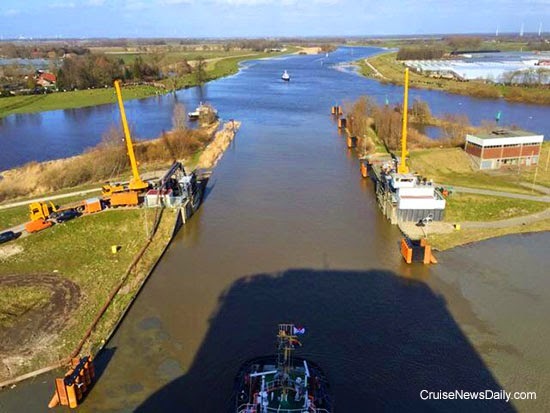 Earlier this week Meyer Werft took Anthem of the Seas from the Papenburg yard to the sea by floating it down the narrow (and shallow) Ems River. Royal Caribbean produced their video of the trip and supplies the facts and figures. You may have to watch the video twice to get it all. In the not-too-distant future, when you come out of the theater on your Princess cruise, if you can’t stop humming one of the songs from the show, there might be a good reason. It might be because it is a Stephen Schwartz song. Princess Cruises just formed a partnership with the talented composer, and over the next few years, you’ll probably hear more and more of his music in the shows aboard Princess Cruises. Royal Caribbean released their deployment details for Europe and Alaska for the summer 2016 season, and they’ve done something interesting in both the Barcelona and Seattle markets. In both cases - in the Mediterranean and in Alaska - Royal Caribbean has taken places normally known for their destination appeal and put ships there where the shipboard experiences often overshadow the destination. The US Coast Guard announced they have suspended their search for the 21-year-old man who went overboard from a sixth deck balcony of Carnival Glory early Sunday morning. The search area was centered on a point five miles south of Abaco Island in the Bahamas. Search efforts covered more than 3,600 square nautical miles during the three-day period without finding the man. Colin Veitch is a name we haven’t heard much of in the last few years - make that since the end of 2008. He was the visionary CEO who took Norwegian Cruise Line from a conventional cruise line to almost where it is today. He had a non-compete clause in his contract with Norwegian, so it wasn’t surprising that he dropped off the radar of cruise news for a while. And it’s not surprising to learn that he’s been involved with Richard Branson and his new Virgin Cruises venture. But it now seems that he’s probably not going to be involved anymore. Do You Know Where Your Drugs Have Been? According to federal authorities, some Norwegian Cruise Line crew members stuff more than socks in their underwear. Five of them were arrested in connection with a scheme involving carrying cocaine off Norwegian Sun in Tampa last weekend in their Spandex underwear. Anthem of the Seas traveled downriver overnight. 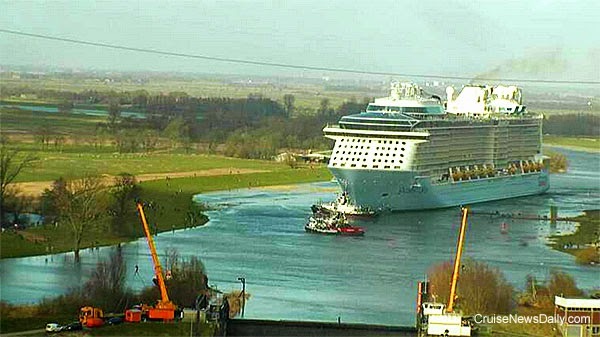 Meyer Werft reports Anthem of the Seas arrived at the Dutch port of Eemshaven Wednesday morning, completing its transit down the Ems River. Provisioning will take place over the next few days, and Anthem will depart on sea trials on Sunday evening. At the completion of the sea trials in the North Sea, the ship will be berthed at Bremerhaven while awaiting handover to Royal Caribbean in mid-April. 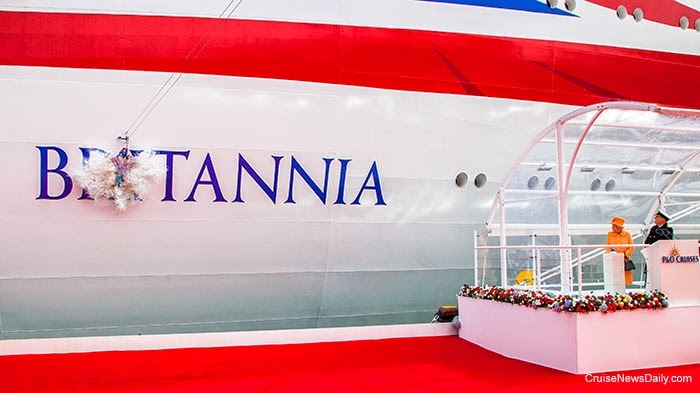 In a splendid ceremony this morning, Queen Elizabeth II officially named P&O's newest vessel, the 143,000-ton Britannia, which celebrates the best of Britain. 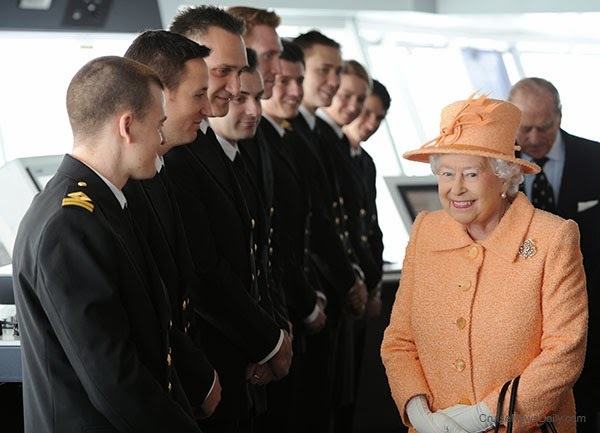 These photos show Her Majesty at the ceremony and visiting the crew. The short video perfectly captures the essence of the day. It always seems Her Majesty's visit with the junior officers and crew is as much a highlight of the day for her as for them. 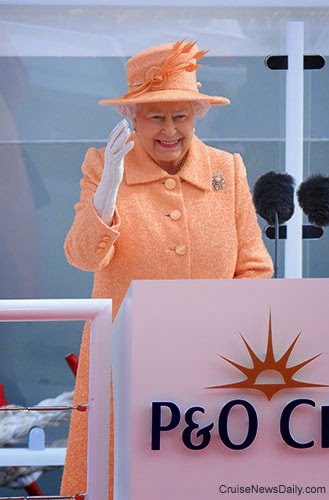 Photos and video courtesy of P&O Cruises. All rights reserved. May not not be copied or used without permission. 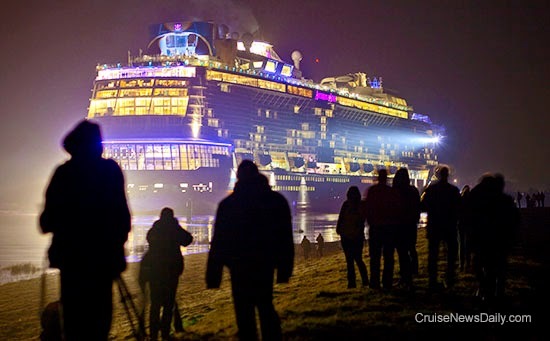 Some 16 hours earlier than planned this afternoon, Anthem of the Seas, left the Meyer shipyard in Papenburg, Germany, avoiding adverse weather that is forecast for Wednesday. The ship is carefully being backed down the Ems River to Eemshaven where it will be provisioned and then go to sea. Just past 2:30pm, Anthem squeezed through the first narrow barrier and into the river. 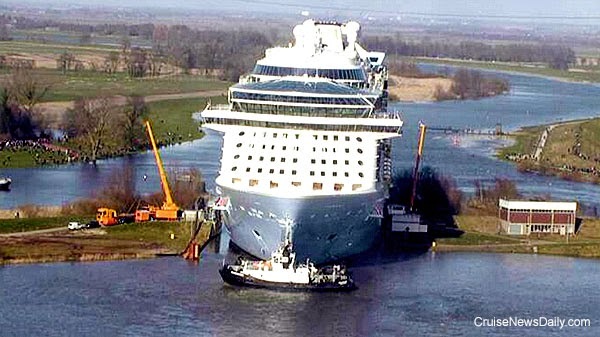 Anthem of the Seas squeezes through the first barrier and into the Ems River. The narrowness of the passages can be seen in the view from the aft lounge (which is going forward for this trip). Crystal Cruises is looking forward to 2018 because both of their ships will be sailing world cruises - but with a unique twist. Crystal Symphony and Crystal Serenity’s world cruise itineraries are very different, but midway they will meet in Sydney. Therein is the twist. Passengers may switch ships at Sydney so they actually have four quite different itineraries to choose from. Meyer Werft announced that after evaluating the latest weather data, Anthem of the Seas will now be leaving earlier than originally planned. The original 6am (local time) departure on Wednesday has now been moved to 2pm on Tuesday. That will put arrival at Eemshaven at about 6:30am on Wednesday. Carnival Glory departed Miami on a seven-night Caribbean sailing Saturday afternoon. The first port was to have been Half Moon Cay on Sunday morning, but early Sunday morning a 21-year-old man was reported missing by his traveling companions. Last week Fincantieri moved Koningsdam from the dry dock to the outfitting dock, and that’s usually a good sign. Along with the move, it was mentioned that the ship would be delivered in March 2016. That was the first hint of a problem, but Holland America had already begun to advise passengers on the first several scheduled sailings that they would be canceled and offered them the opportunity to move to similar sailings later in the spring. Fincantieri had advised Holland America that Koningsdam’s delivery date was going to slip from February 16 to March 31 (2016).